Veteran animator and filmmaker, Steven Woloshen introduces a variety of simple artistic strategies to create decay and to re-assemble damaged film prints into new experimental visions. This book includes a special DVD with nine short films created especially for this do-it-yourself “hands on” manual. Finally. this manual showed me how to expand my used of found footage. Thank you Mr. Woloshen. Woloshen's films are extraordinary. They are rigorously thought through and a delight to the eye and the ear. He explores the concept of decay in a fresh, original way. There are plenty of filmmakers who use found footage in their work such as Conner, Muller, Arnold and so many others. Woloshen may not be as well known as these filmmakers but his work belongs in that elevated company. I highly recommend this film collection. Thank god for books like this! I have been experimenting on film for a while now, and love having sourcebooks like Helen Hill's Recipes for Disaster. 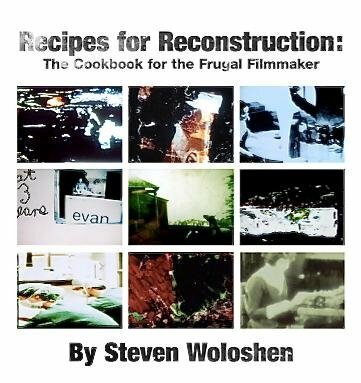 I discovered Recipes for Reconstruction by accident and contacted Woloshen right away for a copy. He is very approachable and enthusiastic. I read the whole thing right away and my mind is swimming with ideas!! I love it! I wish more filmmakers made books like this one.